1902 built for W.A. McGregor of Auckland. Travelled to New Zealand mainly under sail as a brigantine. 1905 sold to Settlers S.S. Co., Auckland. 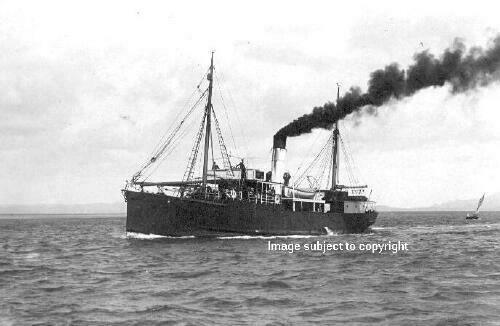 1905 December 23rd collided with and sank the KAPANUI with the loss of 5 lives. 1907 sold to Wm.J. Parker and Jas Smith, Auckland. 1910 cut in half and lengthened. 1940 used as a salvage vessel working on the recovery of bullion from the NIAGARA, which was mined outside Whangarei. 1940 taken over by the Navy and used as a Boom Defence Vessel. Laid up at Devonport Naval Base. 1953 broken up at Auckland.